Polyxenidas a Rhodian general and admiral, who was exiled from his native country, and entered the service of Antiochus III the Great, king of Seleucid Empire. We first find him mentioned in 209 BC, when he commanded a body of Cretans mercenaries during the expedition of Antiochus into Hyrcania . But in 192 BC, when the Syrian king had determined upon war with Rome, and crossed over into Greece to commence it, Polyxenidas obtained the chief command of his fleet. After co-operating with Menippus in the reduction of Chalcis, he was sent back to Asia to assemble additional forces during the winter. We do not hear anything of his operations in the ensuing campaign, 191 BC, but when Antiochus, after his defeat at the Battle of Thermopylae (191 BC) , withdrew to Asia, Polyxenidas was again appointed to command the king’s main fleet on the Ionian coast. Having learnt that the praetor Gaius Livius Salinator was arrived at Delos with the Roman fleet, he strongly urged upon the king the expediency of giving him battle without delay, before he could unite his fleet with those of Eumenes II of Pergamon and the Rhodians. Though his advice was followed, it was too late to prevent the junction of Eumenes with Livius, but Polyxenidas gave battle to their combined fleets off Corycus. The superiority of numbers, however, decided the victory in favour of the allies ; thirteen ships of the Syrian fleet were taken and ten sunk, while Polyxenidas himself, with the remainder, took refuge in the port of Ephesus. Here he spent the winter in active preparations for a renewal of the contest; and early in the next spring (b. c. 190), having learnt that Pausistratus, with the Rhodian fleet, had already put to sea, he conceived the idea of surprising him before he could unite his forces with those of Livius. For this purpose he pretended to enter into negotiations with him for the betrayal into his hands of the Syrian fleet, and having by this means deluded him into a fancied security, suddenly attacked him, and destroyed almost his whole fleet. After this success he sailed to Samos to give battle to the fleet of the Roman admiral and Eumenes, but a storm prevented the engagement, and Polyxenidas withdrew to Ephesus. Soon after, Livius, having been reinforced by a fresh squadron of twenty Rhodian ships under Eudamus (Rhodian), proceeded in his turn to offer battle to Polyxenidas, but this the latter now declined. Lucius Aemilius Regillus, who soon after succeeded Livius in the command of the Roman fleet, also attempted without effect to draw Polyxenidas forth from the port of Ephesus : but at a later period in the season Eumenes, with his fleet, having been detached to the Hellespont while a considerable part of the Rhodian forces were detained in Lycia, the Syrian admiral seized the opportunity and sallied out to attack the Roman fleet. 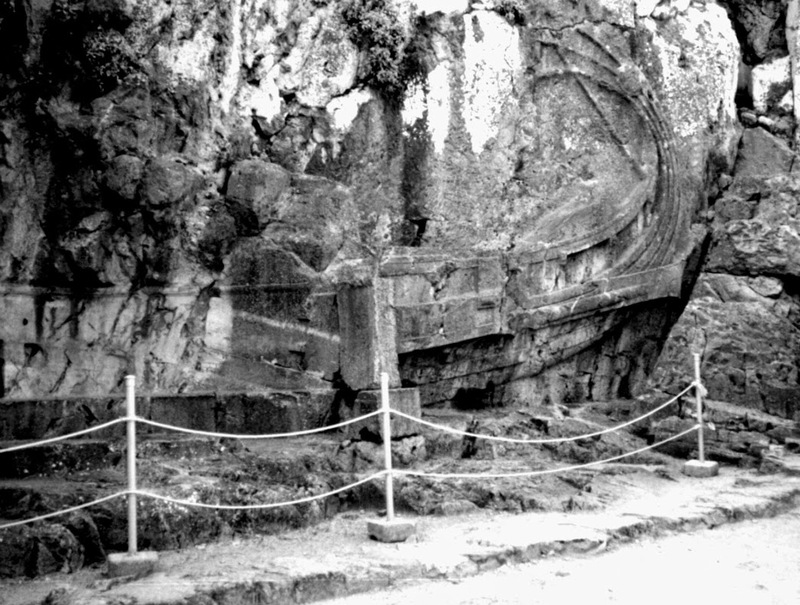 Carving of a triemolia (Rhodian ship), 2nd century BC, Lindos. Carved into the rocks on the route to the Acropolis at Lindos. On the bow there stood a statue of General Hagesander Mikkion, by sculptor Pythocritos. Dates from c 180 -170 b.c. Most easterly of the islands in the Aegean, situated off the coast of Caria in Asia Minor. From the time of Vespasian (ruled 69-79 A.D.), Rhodes, known as Rhodus, was attached to the province of ASIA. The island had a long history of excellent relations with Rome, helping in the Macedonian and Mithridatic Wars. Supporting the cause of Julius Caesar during the Civil War, Rhodes was plundered mercilessly by Gaius Cassius in 42 B.C. but was richly rewarded by Augustus for its loyalty. Starting in 6 B.C., Tiberius took up residence on the island in a self-imposed exile from the disappointments of Rome; he would depart to become adopted by Augustus in 4 A.D. Because of their act of crucifying several Roman citizens, the Rhodians were deprived of their independence in 44 A.D. by Claudius. Appealing to Nero in 53, they were given their own government again, although prosperity was never actually attained. 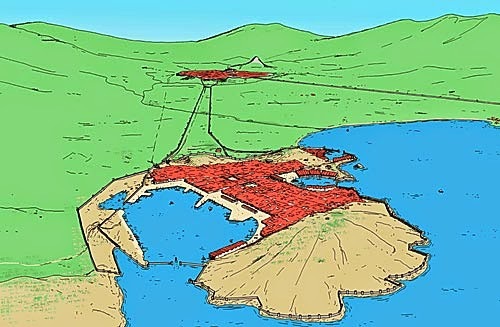 An earthquake in 155 A.D. flattened most of the island, and henceforth it remained one of the least developed corners of the Empire. Though never large, this should be the best fleet of the ancient period. Excellent seamanship coupled with generally heavier types than the Carthaginians. Superior Rhodian naval architecture was a state secret, with the sentence death passed on unauthorized persons in military shipyards. Frequently allied to Rome, the Rhodians provided the major check on pirate activity in the Mediterranean. When Roman policy later diverted trade revenue from Rhodes destroying the economic basis of the fleet, the Mediterranean largely fell under the control of pirates. By the late third century BC, the expansionist ambitions of Philip V of Macedon threatened Rhodes and in 208 BC, they joined other Greek states in an embassy to mediate with him;14 an exercise repeated in the following year. The First Macedonian War ended in 205 BC, with Rhodes’ sympathies leaning towards Rome who, having suppressed Illiyrian piracy and removed the Carthaginian’s power, had provided stable conditions for Rhodes’ trade in the West. The Rhodian’s concerted action against Crete and its pirates also alienated Philip, as president of the Cretan confederacy.15 Philip’s increasing aggression and build-up of naval power led to open war between them in 202 BC. The following spring, Philip’s fleet seized the Cyclades and Samos. Rhodes sent a fleet of thirty ships to Lade, where they were bested by Philip’s greater numbers in a brief batrle, losing two quinqueremes. They did subsequently recover most of the Cyclades. Pergamum, also threatened, now joined Rhodes in the war, their joint fleets meeting and defeating that of Philip at the battle of Chios.16 A further battle near Miletus resulted in a Pyrrhic victory for Philip and cost him nearly half of his fleet. Rhodes and Pergamum appealed to Rome for help and with the addition of a Roman fleet of thirty-eight ships and those of the allied Athenians, Philip was unable to mount any further challenge at sea. The allied fleets harried enemy coasts, with the Rhodians blockading Philip’s ships at Volos (Demetrios) until the end of the war in 197 BC. In 194 BC, Rhodes sent eighteen ships to join those of Pergamum in defeating the bellicose King Nabis of Sparta. Plan of the shipsheds of the military port of Rhodes: those to the west are the width suitable for larger triremes and quadriremes, but the eastern slips are narrower and presumably intended for lighter craft like tribemioliae with which Rhodes was closely associated. The ships rated higher than ‘ten’ seem not to have been used for ship-to-ship combat, so an additional explanation must be sought for their design. The use of ships as fighting platforms to attack city and harbour defences, for example by Demetrius I Poliorcetes against Rhodes in 305 (Diod. Sic. 20.85–8), suggests that the very large polyremes may have been designed with this function in mind. Demetrius’ fleet of 500 ships was likely to have been deployed against the coastal cities of Asia Minor, had he not been ousted from Macedon by Pyrrhus in 287. In this respect, the largest polyremes are analogous to the very large siege towers built for Demetrius’ attacks on Salamis and Rhodes in 306 and 305 respectively. By no means all the ships used in the naval warfare of this period were triremes or polyremes. The Rhodian navy contained a substantial number of vessels of a type known as tribemioliae, which means something like ‘three and a half’. This ship was probably a variation of the trireme, or ‘three’. The Rhodian tribemioliae seem to have had a crew of 144, as compared to an Athenian trireme which had 200. It seems that about 120 of the crew were oarsmen, compared to the 170 used on the trireme. It is most likely that the reduction was effected by having fewer men on the lowest level, enabling the ships to be narrower towards the bows and stern than a trireme, thus compensating for the loss of oar power with a sleeker shape. As they also carried fewer marines and sailors, they would have been significantly cheaper to operate. The various Macedonian generals who fought over all or part of Alexander’s empire were gifted with vast ambitions, enormous funds and manpower resources, plus access to the timber supplies of Cilicia, Syria, Phoenicia, Cyprus and Macedonia. Hence they were able to build substantial fleets of increasingly large ships. Antigonus Monophthalmus established three shipbuilding yards in Phoenicia, one in Cilicia and another on Rhodes to create the ships for his contest with Ptolemy I Soter. These facilities produced an impressive number of ships in the period 314–302, so many that Antigonus had nearly 400 warships, plus at least 100 transports. Smaller political entities like the Achaean and the Aetolian Leagues, or the island of Rhodes, did not attempt to operate large fleets. In 191–190 the Rhodians played a significant part in the naval conflict between Rome and her allies and Antiochus III, but the largest Rhodian fleet assembled consisted of only thirty-two ‘fours’ and four triremes (Livy 37.22–3). The Rhodians had a good supply of experienced sailors, marines and naval officers, as well as well-trained oarsmen. It is likely that naval service was required of all young men with full or partial Rhodian citizenship, but even these reserves had to be supplemented by foreign oarsmen and sailors. The speaker reminded his audience that the emphasis of his talk would be on naval power rather than navies, naval bases, ships and men. Sea power may be conceived, he said, as having two purposes; to guard one’s own trade and use of the sea , or to deny its use to somebody else. In modern times for example, the British navy has been predominantly a sea-use navy, whereas the German and up to Napoleonic times, the French navies have been for sea denial. The means and scope of both use and denial obviously depend on the availability of finance, materials, men and techniques and the political will to provide these. Until the arrival of aircraft and satellites finding a ship or fleet at sea out of sight of land was like looking for the proverbial needle in a haystack. From a ship the visual horizon is 5 to 13 miles distant. Sea battles have mostly taken place therefore near land, with the added advantages of not being far from a base and near supplies including fresh water. Finally we have to remember that ancient mariners needed shelter in bad weather. At this time warships had large crews, sometimes rowing hard if the wind did not serve, and the temperature may be high. It has been estimated that as much as a ton of water could be consumed per 40 miles. Crews had to take more on board every two or three days. 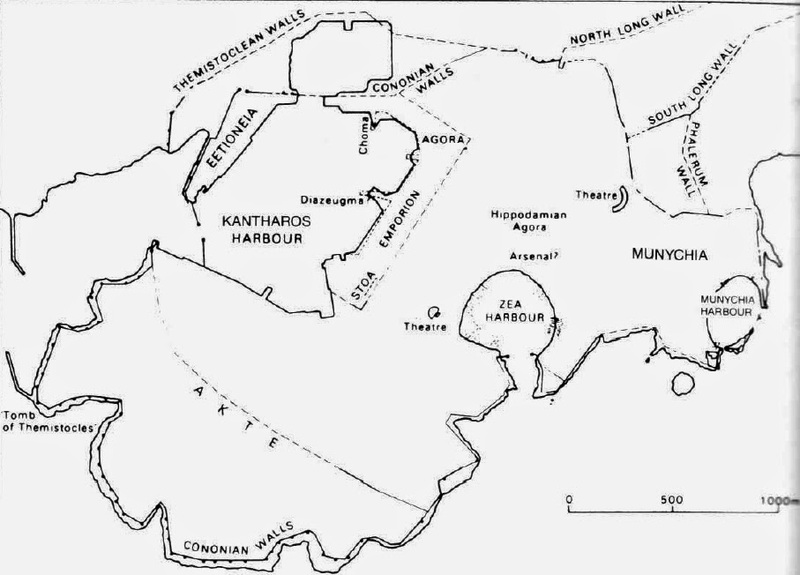 The difficult terrain of Greece made transport by land laborious and expensive and all ancient trading and communication was by sea whenever that was possible (see map). Thousands of merchant ships that plied the coasts of the Mediterranean were an easy prey for pirates whose heavily manned oared ships were able to intercept them from their bases. Piracy was endemic throughout this period and sometimes was on a large scale (for a good account see Ormerod in book list below) necessitating major naval campaigns from time to time. The control of piracy may have absorbed more effort than surviving accounts suggest. A common warship of the sixth century BC was the trieres or trireme, with 140 oars on three level, first developed a century earlier, possibly in Egypt (see diagram), which at today’s prices would cost £1m to build and four times that per year to man. It was swift enough to deal with pirates, though not superior in a ramming battle to the 50-oared pentacontes, which had oars on two levels. This latter cost about one quarter as much as a trireme The ram fitted to such vessels was a projecting timber structure built onto the bow, terminating in a cutting bronze casting. Naval power played a significant part in the contest between the Greeks led by Athens and the Persian empire. 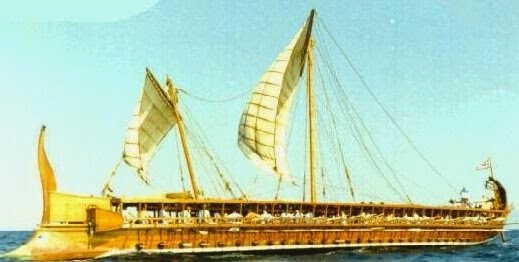 After Marathon, the Athenians put their faith in ships and quickly built a sea-denial defensive fleet of 200 triremes. At the decisive battle of Salamis in 480 BC the Athenian admiral Themistocles successfully lured the Persians into narrow waters with a divided fleet, so that their numerical superiority was a handicap. Xerxes lost the command of the sea that he needed in order to supply his army and the abandonment of the Persian campaign followed. In the following fifty years Athens operated fleets in Egypt, Cyprus and Asia Minor, achieving that superiority, exercised through the Delian League, which according to Thucydides provoked the Peloponnesian War. At this time Athens built the Long Walls securing her connection with the port and naval base of Piraeus. In 433 BC Athens sent out 30 ships to support Corcyra (Corfu) in its confrontation with Corinth and her allies. This entailed a passage round the Peloponnese, taking about four days. The usual routine on such a passage was to moor the ships at a beach for the night, stern-to. The crew slept ashore guarded by ten hoplites and four archers, the complement of each ship. Before or at first light they would have a meal, embark, row or if the wind served sail, until noon. They would go ashore again during the heat of the day to fetch water, eat and rest until about 6 pm and then sail onward until nightfall, a routine that required a knowledge of a coastline and its inhabitants. For defensive purposes a squadron of, say, six ships by mustering a line of 60 hoplites and covering fire from 24 archers, was adequately protected. In 430 BC there was an extraordinary action at the entrance to the Gulf of Corinth. At the approach of the Athenian admiral Phormio, the Corinthians formed a defensive circle of triremes, bows outward. The Athenians circled them more and more tightly until, as expected, a wind sprang up and the crowded Corinthian ships lost formation in the choppy water. At a signal from Phormio the exposed ships were rammed and the battle won. This was naval mastery; good ships, well trained crews able to cope with choppy water and an astute admiral. These benefits were expensive and the taxes imposed by Athens in the name of the Delian League were resented. Pericles justified Athenian leadership by asking “how can (Peloponnesian) men achieve anything who are farmers? The fact is that sea power is a matter of skill….. and it is not possible to get practice in the odd moment when the chance occurs, but it is a full time occupation, leaving no moment for other things”. It is worth noting that there was no snobbishness about being an oarsman and only rarely did slaves row. On one occasion when there was a need for 1,000 hoplites to go to Lesbos, they simply rowed and sailed themselves there in triremes. Athenian supremacy was compromised by the failure of the expedition against Sicilian Syracuse in 415 BC when the ships needed to protect the camp located near the Great Harbour had to be afloat so long that their condition deteriorated. The Syracusans attacked them with success and this led a general defeat. Athens herself was besieged and fell in 405 BC. In the 4th. century Carthage grew into a great trading and naval power and came into conflict with Syracuse over grain supplies. Heavier warships came into use now,some with more files of oarsmen, the best known of these is the ‘5’ (Greek: penteres or Latin: quinquereme), which had three rows of oars each with two oarsmen. The reason for this change remains obscure, but it may be that skilled oarsmen were harder to obtain. The heavier ships had rams but they would have been slower to manoeuvre and so the main emphasis was on boarding and later the discharge of missiles from catapults. Many ‘4’ s (teteres or quadriremes) were built (2 rows of double-manned oars) and they had the advantage of fitting into existing trireme slipways and sheds. No slipways for ‘5’s have been found possibly because their hulls were sheathed in lead as with merchant ships and they were kept afloat. A fresco at Pompeii suggests the existence of roofed-over docks. The meteoric career of Alexander the Great came to an end in 323 BC and in the ensuing contest for supremacy among his successors the naval wars involved large fleets of ‘4’s and ‘5’s. Nevertheless when in 307 BC the Macedonian fleet under Demetrios took on and defeated the Egyptians at Salamis (Famagusta in Cyprus), there were ‘6’s (hexeres or sexeremes) and ‘7’s (septerems) in his fleet as well as some triremes, though ‘5’s predominated. The consequent invasion of Egypt failed; delays, loss of ships through storms and reefs, followed by an unsuccessful landing gave Ptolemy time to mount an effective defence on land. In 305 BC Demetrios was involved in the siege of Rhodes, a rival naval power. On the larger ships of his fleet of 200 he mounted catapults and siege engines, but his warships and supply vessels suffered losses from the sorties of the swift, modified triremes of the Rhodians. These were called ‘trihemioliae’; in other words they possessed two and a half files of oarsmen. In 304 he accepted mediation and withdrew. In the Classical World naval operations distant from a home base were always hazardous. The Zea Harbour Project combines land and marine archaeology to obtain a full picture of the ancient Zea Harbour in the Piraeus, Greece. The ancient naval installation at Zea is among the largest Classical building complexes, and it accommodated the ship of the line in the Classical period – the trireme. The objective of this website is to introduce you to the work of the Zea Harbour Project and its most important results. 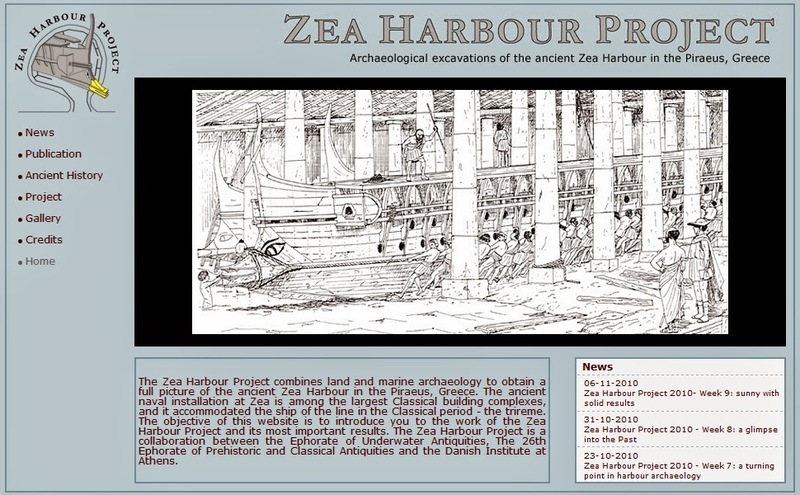 The Zea Harbour Project is a collaboration between the Ephorate of Underwater Antiquities, The 26th Ephorate of Prehistoric and Classical Antiquities and the Danish Institute at Athens. 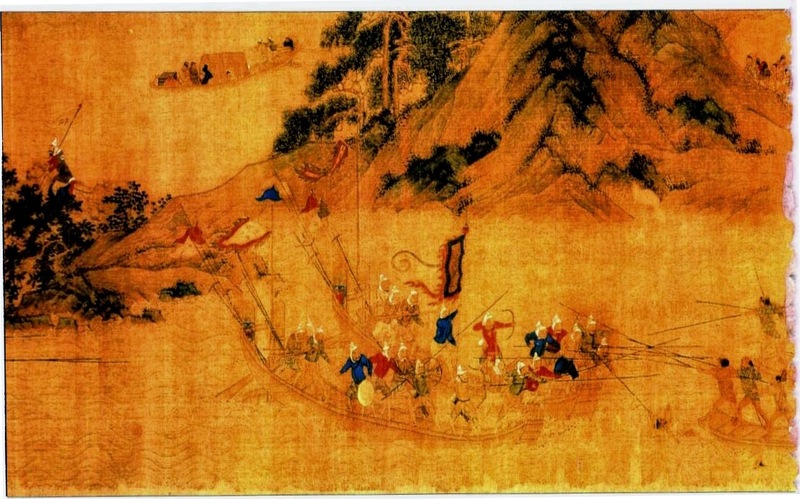 Ming soldiers use a sampan to repel Japanese wako (pirates). The wako were the curse of the Far East for much of the 14th and 15th centuries, raiding Korea and China. When we turn to the first all-wooden boats in China we encounter a word that was to become very well known. The word ‘sampan’ is derived from the Chinese ‘san’ meaning ‘three’ and ‘pan’ meaning ‘planks’, the whole being a symbolic representation of a small boat. As a class it represents boat in its most rudimentary form, and doubtless the derivation of its popular name indicated its origin from a raft of three planks or logs. If its construction is studied, it becomes apparent how, through a process of evolution, it would occur to the ancient naval architects to build up the fore end of the raft to create a bow. Later improvements would have included the introduction of a transom in the stern. Ancient stone carvings give us our first pictures of Chinese sampans, and it is fascinating to note that one representation, dating from AD 147, shows sampans being used for naval warfare. 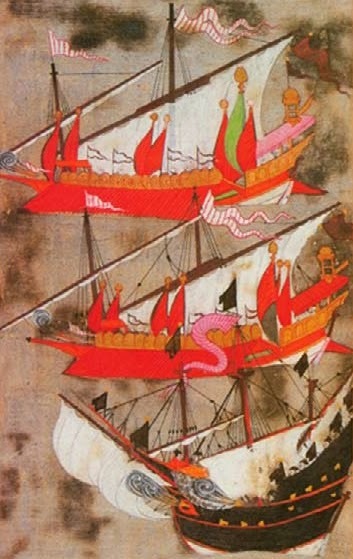 The boats are of a characteristic shape, and we see combatants armed with swords and shields, while one has a bow and arrow. A single oarsman in the stern propels the sampans.